British 1950's: This is a small range that was requested by a few people. British Army still dressed in their WW2 uniforms and webbing armed with the L1 SLR. NATO - Generic: There were many NATO nations that looked more or less the same (M1 helmets and similar webbing) other than the rifle carried. 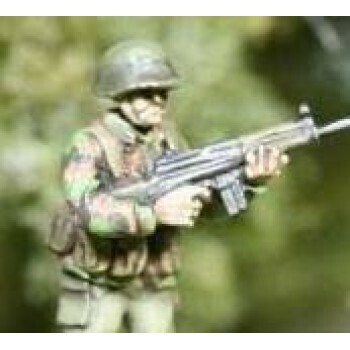 In our NATO range we will cover the basic G3 and FAL troops and also packs to make the sets nationality specific with LMGs and SMGs. NATO- West Germany: While similar to the Generic Nato range, the BW sets have an additional gas mask bag and netting or foliage added to their helmets. They can be used as any other NATO force mixed in with the NATO range if painted the same. NEUTRAL: A section for Nations that were not in NATO or WARPAC during this era. 20mm Modern Elhiem x3 Early Cold War British Riflemen with L1 SLR Battle Rifle skirmishing in WW2 un..
20mm Modern Elhiem x3 Early Cold War British Riflemen with L1 SLR Battle Rifle advancing in WW2 unif..
20mm Cold War Elhiem x4 G3 NATO Riflemen armed with the G3 rifle, in M1 style helmet and Y strap web..
20mm Cold War Elhiem x4 G3 NATO Riflemen Set 2 armed with the G3 rifle, in M1 style helmet and Y str..
20mm Cold War Elhiem x4 Generic NATO w/ LMGs armed with the MG3 GPMG, in M1 style helmet and Y strap..
20mm Modern Elhiem x2 Irish GARDA Police armed with UZI and Revolver..
20mm Modern Elhiem x2 Police Plain clothes armed with UZIs can also be used as insurgents/surviours ..
20mm Modern Elhiem x3 NATO Carl Gustav figures 3x same pose from the BW04 set. 1 figure has helmet f..
20mm Modern Elhiem x3 NATO Generic FN MAG GPMG gunners for nations that used the FNMAG. NATO GPMG fi..
20mm Modern Elhiem x3 NATO generic gun crews for MMGs, mortars, field guns etc. with no rifles in cr..
20mm Cold War Elhiem x4 US ARMY Patrol Fire Team in the PASGT Armour (K Pot and Body Armour) with 2x..
20mm Cold War Elhiem x2 US Army/USMC in K-pot helmet, PASGT Body armour casualty..
20mm Cold War Elhiem x1 US Army/USMC Commander in K-pot helmet, PASGT Body armour with Alice webbing..
20mm Cold War Elhiem x3 US Army/USMC Kneeling with M16A2M203, SAW and LAW72 in K-pot helmet, PASGT B..
20mm Cold War Elhiem x3 US Army/USMC NCO's with M16A2 in K-pot helmet, PASGT Body armour with Alice ..
20mm Cold War Elhiem x4 US Army/USMC seated vehicle crew..
20mm Cold War Elhiem x2 US Tank crews 1/2 figures in K-pot helmet, PASGT Body armour Tank crews..
20mm Cold War Elhiem x2 US Army/USMC in K-pot helmet, PASGT Body armour Tank crews bailed fighting..
20mm Cold War Elhiem x3 US Army/USMC with M16A1s in K-pot helmet, PASGT Body armour with Alice webbi..
20mm Cold War Elhiem x3 US Army/USMC with M16A2 and LAW72 in K-pot helmet, PASGT Body armour with Al..
20mm Cold War Elhiem x1 US Army/USMC with M16A2 and M47 Dragon ATGM firing in K-pot helmet, PASGT Bo..
20mm Cold War Elhiem x1 US Army/USMC with M16A2 and M47 Dragon ATGM moving in K-pot helmet, PASGT Bo..
20mm Cold War Elhiem x1 US Army/USMC in K-pot helmet, PASGT Body armour with Alice webbing armed wit..
20mm Cold War Elhiem x1 US Army/USMC with M16A2 and Stinger AA Missile in K-pot helmet, PASGT Body a..
20mm Cold War Elhiem x3 US Army/USMC with M16A2s in K-pot helmet, PASGT Body armour with Alice webbi..
20mm Cold War Elhiem x3 US Army/USMC with M16M203s in K-pot helmet, PASGT Body armour with Alice web..
20mm Cold War Elhiem x2 US Army/USMC with M21 Sniper rifle in K-pot helmet, PASGT Body armour with A..
20mm Cold War Elhiem x2 US Army/USMC with M60 moving and M16A2 no2 in K-pot helmet, PASGT Body armou..
20mm Cold War Elhiem x3 US Army/USMC with M60 Sustained Fire tripod team in K-pot helmet, PASGT Body..
20mm Cold War Elhiem x1 US Army/USMC in K-pot helmet, Alice webbing, PASGT Body armour with M60E3..